"Phil Jones Bass is all about being extreme, and I am not going to make any gear that is just good enough," states Phil Jones. As the president of PJB and a professional bass player himself, the British-born Jones adds, "speaker design is an exact science these days, and we calculate things such as cone excursion and air flow velocity in the vents per given frequency long before we even build a cabinet." By combining this no-compromise philosophy with over 25 years of experience in the audiophile stereo world and a fanatical degree of attention to detail, Jones and PJB have emerged at the forefront of contemporary bass amplification design and sound reinforcement. In 1998, Jones founded American Acoustic Development which is, today, acknowledged as an award-winning high-end audio firm and the parent company of Phil Jones Bass. With an extensive 100,000 square-foot manufacturing facility and a staff of over 150 employees, American Acoustic Development produces loudspeakers and amplifiers for the home, car, and pro audio marketplace as well as the entire product line of Phil Jones Bass. 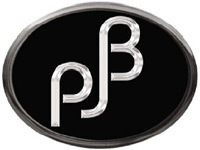 Based in St. Louis, Missouri, PJB builds a broad spectrum of high-fidelity amps, exotic-looking cabinets, and combo amps which are accentuated with custom-designed 5-inch speakers and maintains a list of endorsing artists that includes legendary bassists such as Chuck Rainey and Bob Babbitt. In this interview, Phil Jones talks about the inherent engineering obstacles of bass amp design, the advantages of using small speaker drivers, the primary differences between PJB equipment and bass gear produced by other builders, PJB speaker cables, and the debut of PJB's proprietary neodymium speakers. How did Phil Jones Bass get started? Bass playing and building bass amps is so ingrained in me that it has become part of my DNA. I was 13 when I designed my first bass guitar, and within a year, I had built my first amp and speaker. I always wanted to have my own bass amp company, and when my existing business, American Acoustic Development, started to flourish, it gave me the opportunity to get PJB started. It took my 25 years of loudspeaker building experience and a no-compromise philosophy to create a company that produced the highest performance amplification. In terms of engineering, what is the most significant challenge that you have to deal with in attempting to replicate the true tonal spectrum of an electric bass guitar? The bass guitar places a huge demand on a loudspeaker because it is so full-range in terms of the audio spectrum and dynamic range. Unlike guitar amplifiers, bass amps need to be clean and very powerful, and both cost a lot to get it right. High fidelity is never cheap and neither is gobs of sheer power. The biggest obstacle is really when it comes to speaker design. There is a rule that can never be broken. Think of it like slicing a pie three ways. One slice is for translational efficiency of electrical power to acoustic power or in other words how loud you can get with a certain amount of power. The second slice is low frequency extension or how deep you can get, and the third slice is physical size. 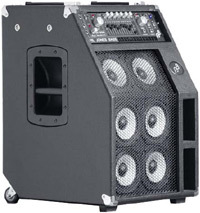 We know just how much we can get out of a conventional 2x10 or 15-inch driver enclosure and how well it converts watts to SPL, but if someone told me they had a shoebox-size enclosure that could reproduce a low B-string with the room shaking at 20 watts, I would like to know what they had been taking. 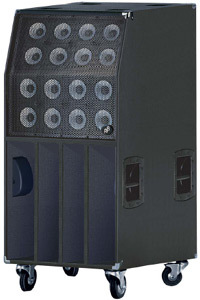 Can you explain the advantages of PJB's Piranha speaker configurations and using small 5-inch drivers as compared to the larger 10, 12, or 15-inch drivers that are found in most conventional speaker cabinets? 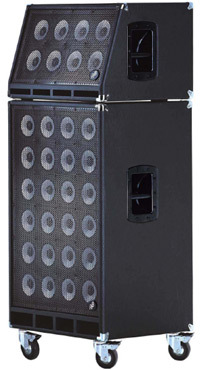 Large speakers are more efficient at producing low frequencies to a certain extent, but a 4x10 bass cabinet can produce deeper and more powerful lows than a single 12 or 15-inch speaker. The reason for this doesn't really have anything to do with cone size but rather the total radiating surface of the speakers. A 4x10 speaker configuration simply has far more surface area than a single 15-inch speaker, and the control of a 4x10 will be better due to the cones being smaller and therefore behaving more like a piston. Even 10-inch drivers have their limits, and they are simply not capable of producing the extended high frequency range a bass guitar has in today's playing. It took over 10 years to perfect the PJB 5-inch Piranha loudspeaker. The biggest obstacle in loudspeaker design is as old as the loudspeaker itself. High frequencies are almost impossible to reproduce at high levels with fidelity because all high frequency speakers are delicate. How many times have you heard about PA horns or studio monitor tweeters blowing out? High frequency speaker motors are much smaller than the motors on cone speakers, and that means less power can go into them without the chance of them burning out. The PJB driver had to be delicate enough to reproduce the highest frequencies and yet be rugged to handle the brutal amounts of power of low frequencies and at the same time without any interference from each other. What do you feel distinguishes PJB speaker cabinets and amps the most from the sound reinforcement products built by other manufacturers? For one, we have another division in my company dedicated to designing and building the world's best home audio and studio monitor loudspeakers. I can't think of any other bass amp company who has the knowledge and expertise to do this. If they could do this then they would have zero credibility in the world of hi-fi. Bass amps are really hi-fi's on steroids. They are very clean and powerful or so they should be. That means a lot of our knowledge and technology trickles over to PJB bass amps. To start, we would never consider buying a speaker unit to put in our enclosures. It just would not be an exact fit, and as a speaker designer, I feel I can make a far better transducer to fit the requirements of PJB than an existing off-the-shelf speaker producer. Our amplifiers go way beyond the performance of other amps because we do not overrate them. When we say a given power rating, we mean it. We don't use some hypothetical figure that was created by a marketing department. 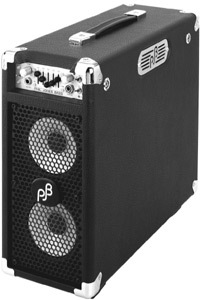 I would always caution the use of a 500-watt PJB amp on a competitor's 500-watt speaker. You may find that the PJB amp ate it for breakfast if you are not careful. It's not that PJB's are just extraordinarily powerful, but the fidelity is so good that you can actually use them as high-end audio power amps, up there with a Krell hi-fi amp which is considered one of the world's finest. My forte is loudspeaker design. I have a 25-year track record in this field and several famous people have used my loudspeakers from James Taylor to members of Earth Wind and Fire, not to mention Abbey Road Recording Studios and all the renowned GRP records were recorded using them. I hired a close friend, Randy Slone, as our consultant on power amp design. He pretty much rewrote the book on this, and you can read his work at McGraw Hill Publishing. One of his best selling books is The Audio Power Amplifier Construction Manual. In my opinion, Randy knows more than anyone in the field of solid state power amps. He's the best, and he did all of the PJB power amp stages in our units. Another difference is that so far we have never had a blown speaker in the history of PJB. Can anyone else out there boast this? Are there common features shared amongst most PJB cabinets and amps? Yes. When you find something good, why change it? Many components, such as the 5-inch drivers, are common because this reduces the amount of inventory needed in production which saves us costs, and I can pass that savings onto our customers. One of my major philosophies regarding manufacturing and design is to always try to spend the customer's hard-earned cash wisely. Since most PJB speaker cabinets are front-ported, did you find a considerable tonal difference between front-ported and rear-ported cabinets that led to your decision to manufacture mainly front-ported cabinets? One of my good bass-playing friends, Mark Egan, told me one day that he always preferred the sound produced by a front-ported enclosure. I greatly respect his opinion, and the front-ported design was implemented in PJB cabinets. The Briefcase has the vent on the back simply because that was the only space for it. Did you have a particular style of music or performance context in mind when you conceived the massive PJB 24B enclosure? The 24B was conceived as a no-compromise speaker. It is so very powerful that it can be scary. It therefore lends itself to any bass player who wants to not only cut through the sound produced by Marshall stacks but cut them down, too! For reggae bass, you will feel like it is stopping your breath, and for slapping, this speaker is not percussive but more concussive! For really deep bass and I mean "down to the bowls of the earth bass," our 16H is the choice. It is so massive. The bass is hard to imagine. You have to stand in front of it at full power if you dare. It is best suited for either rich star players who have a road crew or for bassists who just love pumping iron after gigs. As for music, it works great with all types. Well, maybe it wouldn't work well for string quartets, but it would work anywhere you are looking for that punch in the guts, slap in the face, poke in the eye, high-level bone-crushing tone! If you buy one of these cabinets, two things will happen. First, you will develop muscles, and second, you will sound better than what you really are! Unfortunately, good looks and stardom is something I can't promise, but every bit helps so let's start with getting back into shape! Which product has proven to be PJB's most successful unit, and why do you feel that particular model has become so popular? For many reasons, the Briefcase has been our best-seller. It sounds too good to be true for its size, it is affordable, and it is the only true high performance amp that can run on battery power. For a bassist who might be debating upon which PJB cabinet or amp would work best for their specific situation, what should a person keep in mind when choosing between products? First, I always recommend getting the best quality gear you can afford. You won't regret that, but you will regret getting lesser gear that you are unhappy with. Great equipment, like a fine instrument, will force you into becoming a better player. There is no need to have a sledgehammer in order to crack a nut so don't go for something too big that makes it a pain to carry around when you are only using a fraction of the power necessary for your situation. All PJB gear is really built with the same philosophy and that is making the best sound possible. A PJB Briefcase has exactly the same sound quality as a 24B. The difference is in quantity and nothing else. I'll never understand why any company decides that practice amps should not sound as good as their larger amps. With that way of thinking, why would anyone want to practice when the sound of their bass is bad? If you sound really good when you practice, then you will be encouraged to play more and that's a good thing for any player. What makes PJB speaker cables different from other speaker cables? Just take a look at a PJB cable, and compare it to any other brand cable that you see. The difference is immediately noticeable not only just due to how massive our speaker cables are but also because of their feel and quality. We also have measurements on all of our cables to prove that PJB cables are quieter and more transparent sounding than any other cables. I am not going to make any gear that is just good enough. PJB is all about being extreme and by that I mean the absolute best gear money can buy. We design and manufacture our own cables from the ground up. Nothing looks like them, and there is definitely nothing that sounds like them. Are there any new products expected to debut from PJB in 2007? Yes. At the next NAMM show, you will see digital amps done right and our own proprietary lightweight neodymium speakers under the trademarked name Neo Power. I can't say too much yet without letting the cat out of the bag so I will give you some hints. We'll debut something with 100 watts that weighs 18 lbs. and is very loud, clear, deep, small in size, and very affordable. The Briefcase is not your usual combo practice amp. The most striking difference between this combo and others is that it features an extremely clean and powerful amplifier and full-range compact speaker that can run on AC or DC power. It can accept voltages from 100 to 240 volts by using the voltage selector switch and can run on an internal lead acid gel battery or even an external 12V DC source such as an automotive starting battery. Though it is a dedicated bass amplifier, this unit will work well for other instruments, particularly of the acoustic variety due to its natural hi-fi sound character. 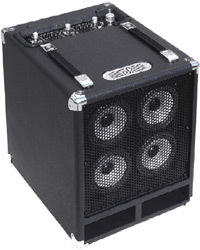 This unit is also an ideal upright bass amplifier. The two 5-inch proprietary PJB drivers have been acoustically optimized by precise computer analysis to provide a full-range, dynamic sound that can play down to an open E-string with ease. The Briefcase can even handle an open B-string if not too much bass boost is used.